Barrier Group Pty Ltd specialises in a range of storage solutions for warehousing and transport applications. The company introduces a quality range of new storage units ideal for keeping small warehouses that do not have room for pallet racking, completely safe. 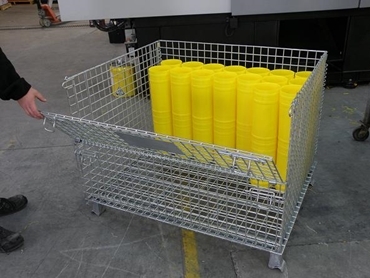 Barrier Group offers the new line of collapsible storage cages designed for transport or warehousing requirements in indoor or outdoor environments. Made from steel with 6mm wire, these collapsible storage cages are designed to collapse in seconds without any requirement for tools. The storage cages feature drop-down gates with self-locking latches to provide access even when stacked. Offering a load capacity of 1200kg, the collapsible storage cages can be stacked up 4 units high in a warehouse environment or 2 units high in transport applications. The storage cage comes finished in zinc plated steel construction with 6mm wire. The cages measure 1200mm x 1000mm x 860mm in size and weigh only 65kg.